August 22nd is Madras day – celebrating the founding of the city (now known as Chennai) in 1639, when the Englishman (this was before Great Britain) Francis Day along with his superior Andrew Cogan struck a deal with the Vijayanagar empire to acquire a stretch of no man’s land, on which to build a fort and to trade from. After lunch I went to the museum in Fort St. George. Security is tight getting in because the fort is now used as the parliament buildings for Tamil Nadu. So today was about history – inside the fort tourists can find both the museum and St. Mary’s, the oldest Anglican church in Asia and possibly the oldest English building in India. 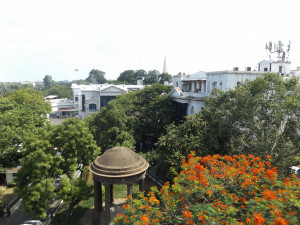 Madras is the oldest of all the modern Indian cities and is the foothold from which English, and then British, dominance grew. Therefore it was interesting to read how much of that history rests on the decisive action of Francis Day. The East India Company was struggling and the English were finding it hard to make in roads into India. The Portuguese and the Dutch had got there first and men like Day were sent out to find better locations from which to trade. War was seen as bad for business and so the EIC were not interested in garrisons and armies; they were more interested in factories. Day thought he had found the right spot to move base, mostly based on the fantastic deal on cotton and trade he had negotiated with the locals. However, back in England, the EIC were reluctant to invest in starting again elsewhere in India. Yet Day pressed ahead regardless. A one point he got into a lot of trouble because he (and Cogan) moved the entire base without permission and began building the new fort without the go ahead from back home. Yet history vindicates his decision. Francis Day reminds me of Mr. Selvam (IBT). Both men were visionary leaders who took risks and were decisive. Neither were reckless. They both listened to wise advice and planned carefully. Nevertheless, they made history because once they had made their decisions they did not waver. No looking back, only pressing ahead. They were not cowards; their convictions gave them courage. Are we raising up these kind of visionaries in the church today? What can we do to encourage them? 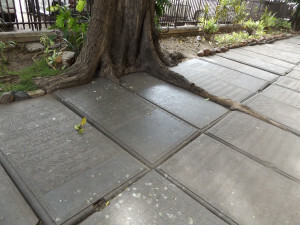 Reading the tombstones outside the old church tells a story of how wealthy and influential Madras became. But not because of chickens.